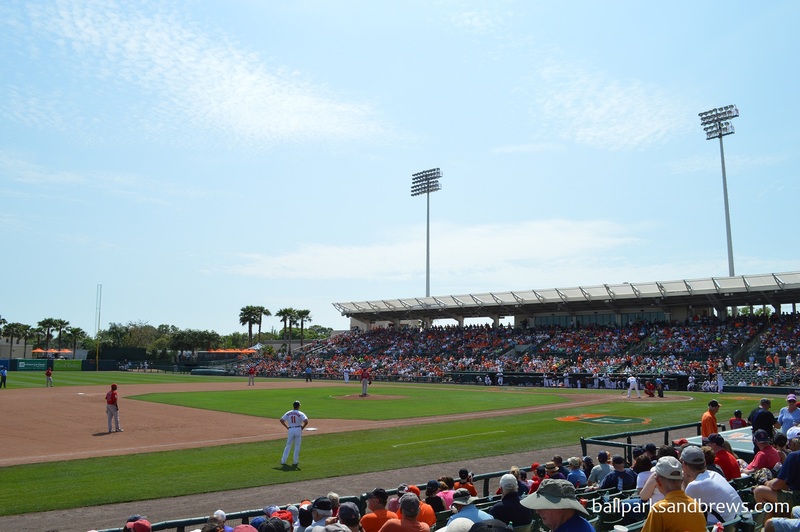 Ballpark Basics: The Orioles have one of the best homes in baseball…for spring training too. 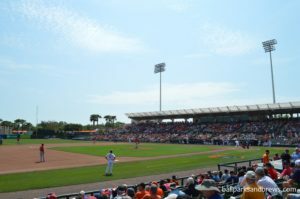 Ballpark Breakdown: Spring Training is a unique phenomenon in sports. No other sport does the preseason as well as baseball. The NFL can’t give tickets away to their preseason games. The NHL play in sparsely filled arenas. However, people travel thousands of miles to watch their favorite (and sometimes least favorite) team play meaningless games before the regular season begins. The Orioles call Camden Yards, one of the most iconic ballparks in the majors, home during the regular season. 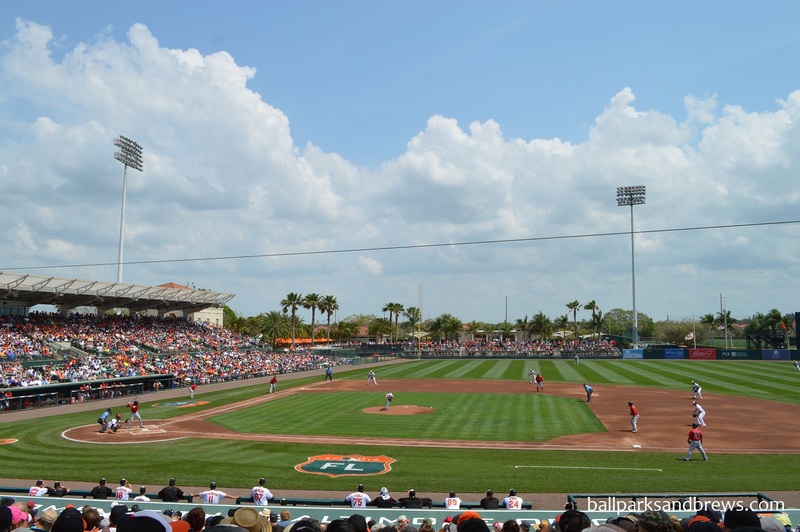 When they moved into Ed Smith Stadium for their 2010 Spring Training stint it was hardly an ideal Spring Training destination. 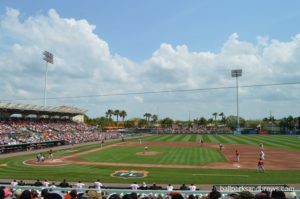 However, after a $31 million renovation during the off-season Ed Smith Stadium is now one of the finest Spring Training facilities in Florida. The team does a great job of incorporating its history throughout the ballpark. Upon entering at the home plate entrance there are a set of banners signifying the team’s playoff appearances. To the right you will find Cafe 54, a nod to their first year in Baltimore. Around the park there are banners for retired numbers, different types of the Oriole logo. Inside the concourse, along the third base line they have painted the different Spring Training logos for each year. 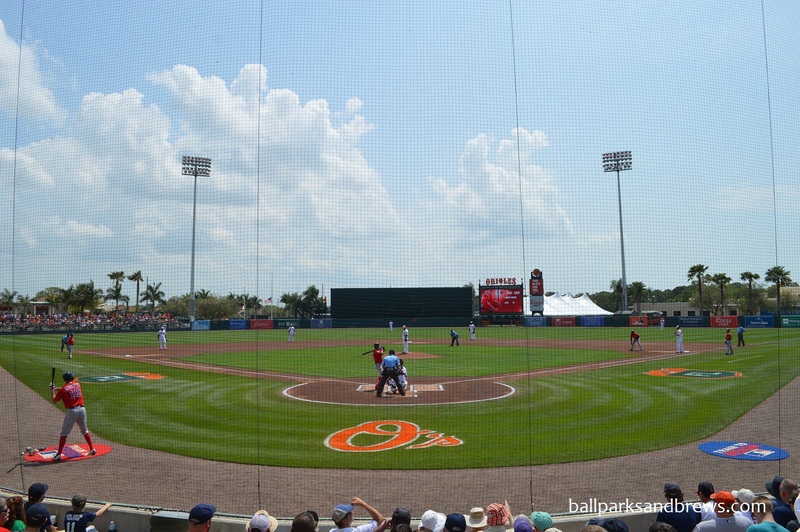 The seats throughout the stadium even come from Oriole Park at Camden Yards. You never question whose park you are in while you walk around. 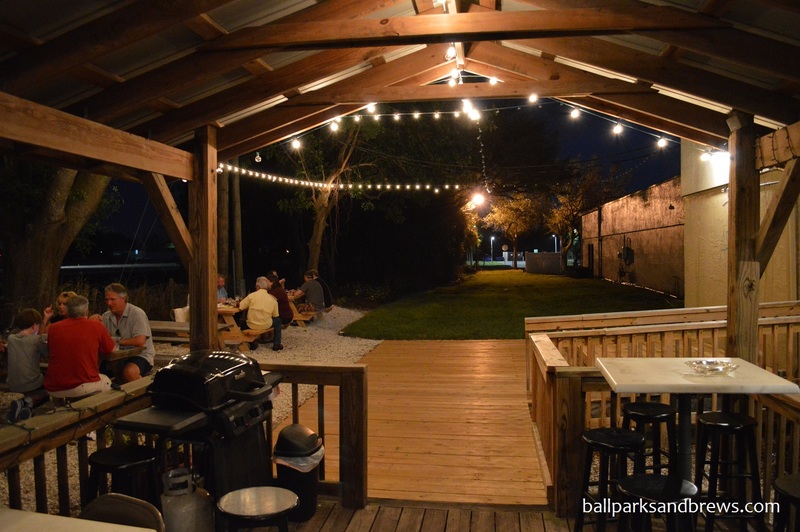 The left field pavilion offers an area where groups can congregate and watch the game. A series of large orange umbrellas give some cover from the Florida sun for those lucky enough to get a spot underneath one. 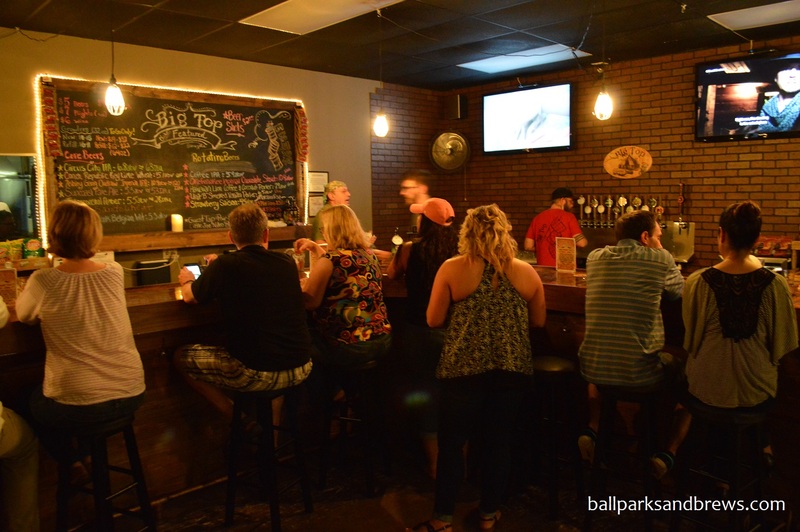 The best spot to find local beer options is behind third base in the main concourse. This is where the concession stand World of Beers is located. While you will be able to find local and craft beers in many of the concessions stands throughout the park, this is where they have a dedicated stand with taps as well as multiple options in bottles and cans. 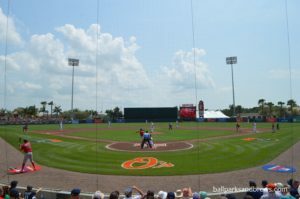 With one of the best ballpark in all of the majors it is nice to see that the Orioles didn’t skimp on the details with their spring home. It is a shame that the ballpark sees so little action throughout the year. Brewery Basics: A brewery whose unique beers are a very flavorful, and not very much like beer. 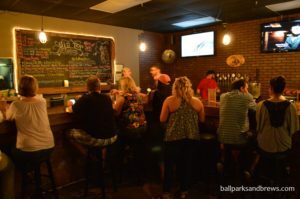 Big Top Brewing is just one of the breweries serving the Sarasota area these days, but it’s definitely the most unique. The theme is actually a historic one, as Sarasota was the original winter home of The Ringling Bros and Barnum and Bailey Circus. There are are sepia toned historic pictures on the walls that take you back to the heyday of the circus, and, along with the similarly veined beer labels, waiver somewhere between creepy and historically cool. Long, dark lacquered tables add to the darker air; and to the right of the L-shaped bar, you’ll find access to a patio. Like a lot of breweries these days, when visiting Big Top you’ll find live music, a boisterous crowd, large sized versions of Jenga and other games, and a food truck parked outside. What you won’t find at other breweries are the crazy concoctions on which Big Top is building their brand. 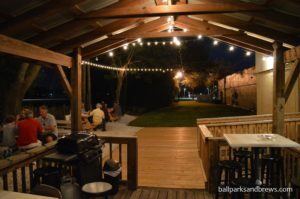 From a cotton candy saison to bananas foster brown, the beer selection here is anything but typical. Strawberry Saison 4.5% ABV – A lighter but still solidly yellow color that was translucent and had a white laced ring. It was served at a warmer temperature than we expected for the style, but that helped bring out aroma which was light and wheaty with easily detectable strawberry overtones. The sip started without much upfront, but then a wheat tanginess leads to a punch of sparkling strawberries to finish. Intercoastal Amber 5.5 ABV/28 IBU – The Intercoastal smelled like baking cookies and tasted like a Frangelico styled liqueur. Copper colored, caramel aroma and sweet but not cloying palate. True to form color, this amber poured a pretty copper color with light brown notes. Coffee IPA 5.9% ABV – Pronounced coffee from aroma to mid-sip, at which point the coffee holds on, but hops fade in and leave a unique aftertaste that is quite a twist from the direction of the beer initially. In color the IPA was just a little more brown and a little less coppery than the Amber. Hawaiian Lion Coffee and Coconut Porter 7.9% ABV – Very much a dark soda colored beer, with no head, lacing or visible carbonation. It had a malted coffee aroma, but the coffee here was more like smelling a cup of coffee as opposed to the coffee grounds smell that many coffee beers give off. It tastes warm and of sugared coconut and finishes like a coffee when a lot of flavored cream has been added. Smooth and sweet.